Baguio City is considered by my family as our second home. No, we don’t own any properties there nor spend a month or so in this amazing city. We just love going there every year! This means that getting by in Baguio City is just a walk in a park for me. This highly urbanized city has become the center of commerce and industry of the entire Northern Luzon and is the seat of power for the members of Cordillera Administrative Region (CAR). To give a brief history, the city was established by the American soldiers as their hill station (only hill station in Asia) in the 1900s. The reason why they call this awesome city as the Summer Capital is kind of funny and very straight-forward. Every summer from March up until about May, sun scorches the whole National Capital Region with intense heat that the seat of power of the whole Philippine Republic can no longer function. Because of Baguio City’s relatively cold climate, they move the government operations to the City to maintain smooth government functions and operations. I always advise my friends to bring enough money during their solo or even group trips to ensure the smooth flow of the trip or vacation. However for this city, It’s okay to bring just enough and if you think you need more, there are numerous international and local banks that offers ATMs. That means, the city’s pretty cool. You don’t need enough money though, should you stay here. Baguio City boasts a regular fit airport named Loakan Airport. However, due to the city’s accessibility through major developed freeways, it is no longer feasible offering such flights from and to Baguio City. Last year, I checked the airport and found out that a private firm opened an aviation school and still is open for private planes or maybe government aircrafts during emergency situations. If you decide to go directly to Baguio City from outside the country, I would suggest flying to Ninoy Aquino International Airport (MNL) or Diosdado Macapagal International Airport (Clark International Airport – CRK). From either airports, there are several options that you can take in getting to Baguio city. This is the usual way in visiting the City of Pines (apparently it has two nicknames). There are several bus liners that ply the Manila – Baguio and viceversa routes. However, it is highly suggested by every tourist or local to take Victory Liner. The liner offers hourly trips to the City from its terminals in Caloocan, Pasay and Cubao terminals. The trip will take about 5 to 6 hours, which depends on the traffic situation in Manila. Fare will cost you about PhP 450.00 to as much as PhP 800.00 and this depends on the bus class you like to take. For more information, visit Victory Liner, Inc.’s website. Partas Bus Lines operates a route from Manila that has a single stop in Clark International Airport that takes passengers to the northern part of Luzon. This can be tricky so pay attention. From Clark International Airport, you need to ask the bus attendant to take you to Sison (travel time is about 2.5 to 3 hours). When in Sison, cross the road to a resto-stop where Victory Liner usually do their pitstop to get dinner. Ask anyone for the bus that departs for Baguio City (travel time is about 1 – 1.5 hours). Clark Airport – Sison (Partas Bus): PhP 180-200.00/head Sison (Victory Terminal) – Baguio City: PhP 80-100.00/heada For more information, visit Partas Bus Company’s website. Just like any major cities here in the Philippines, jeepneys are everywhere! It is the cheapest way to get around the city. However, one should be alert and inquisitive. Go ahead and talk to locals. It’s my technique in making a destination even closer to my heart. Not only that you can get around fast and cheap, you are also creating friendship and memories. If you are not into socializing with the locals, you might as well opt to riding cabs instead. There are lots out there and can easily be spotted through their white paint and taxi signs above. I believe the current flagdown rate is at PhP 30.00 and increases as you go around. You can either hop from one cab to another or just negotiate with the driver about renting the whole vehicle for the day. Depending on which one works out the best for you and your budget. Finally, you can just walk round. 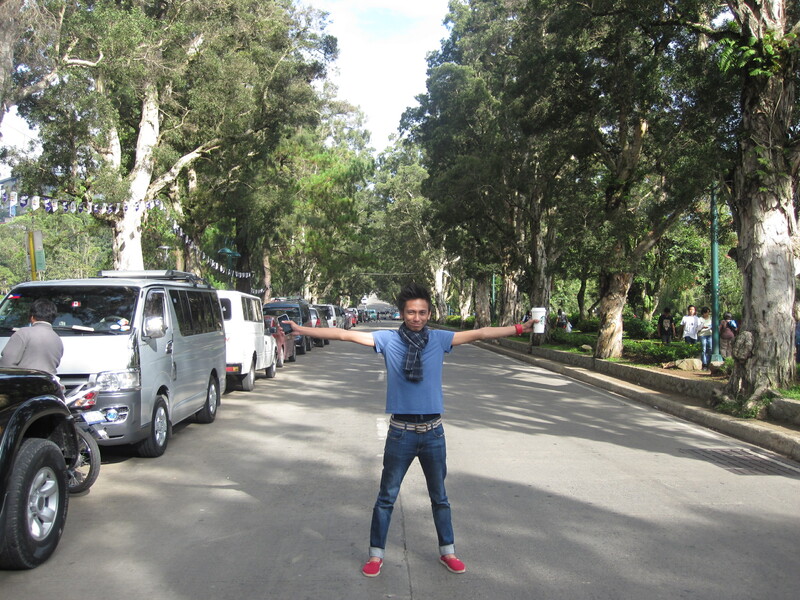 Baguio City for me is the best places to walk around in. You just need to be alert of scams, which every modern city has! Eat: Bistro Cafe, Flying Gecko, Barrio Fiesta, Cafe by the Ruins, and others. *I didn’t include major malls because it’s everywhere around the world with same merchandise offerings. There are several nice hotels in Baguio that would cost from PhP 800 – 3,000.00 each night depending on its poshness. However, for backpackers like me, you can go ahead and ask around and find a room where you can just leave your things and do whatever you wish to do. They call this backpackers lodgers or transient rooms. This is cheaper, especially if you’re gonna stay in the city for a while. A transient room will cost about PhP 300 – 600.00 each night. If you are the type of person who likes to have everything set before going to a destination, I would surely suggest booking a hotel online through Agoda or other websites of such.